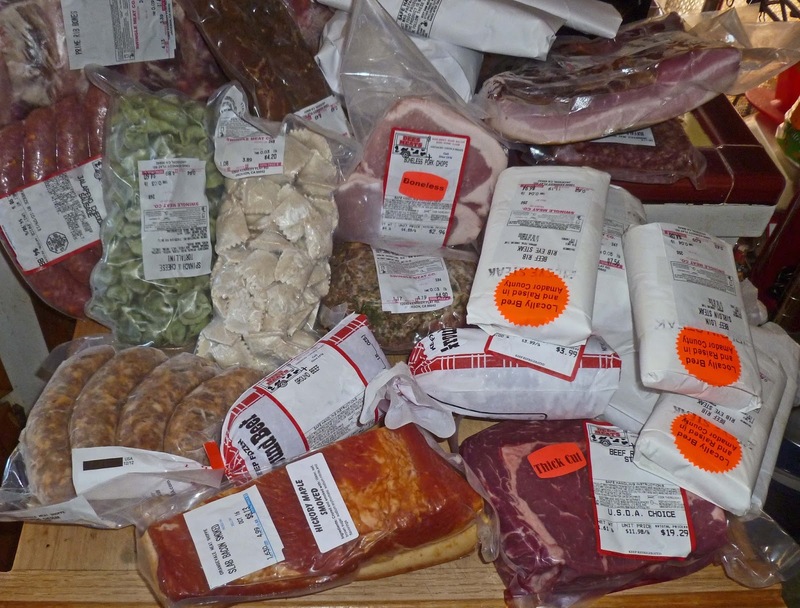 The Chilebrown 'Ice Cave' was getting a little low on meat supplies. It was time to go on a Meat Adventure. This adventure would visit four unique and special butchers in northern California. A distance of over 200 miles would be traveled this sunny morning. This is a small price to pay for the quality of the meat product to be acquired. A common denominator of a large animal mounted on the roof was found at our stops. It is a sign of welcome. It is an indicator of the meaty delights to come. 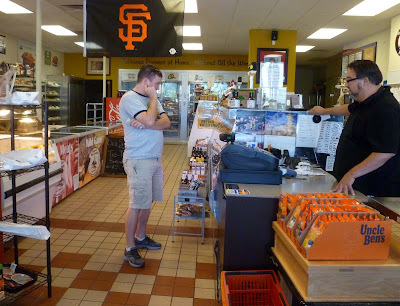 Our first stop was 'Lockeford Meat & Sausage Services.This market is famous for their sausages. Our favorite is Dakota sausage that is a blend of veal, pork and turkey. It is mild and big on flavor. We also picked up some jalapeno sausage. 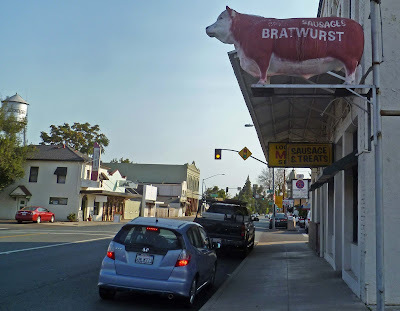 There must be over a dozen different varieties of fresh and smoked sausages. We needed to use restraint because we only had one ice chest and three other stops to go. Swingles Meat Company in Jackson has been an old friend. 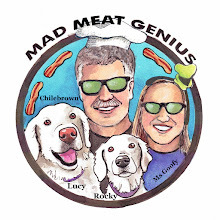 This is one of our favorite old time butchers. This is a full service meat locker. Local farmers bring their animals for processing. 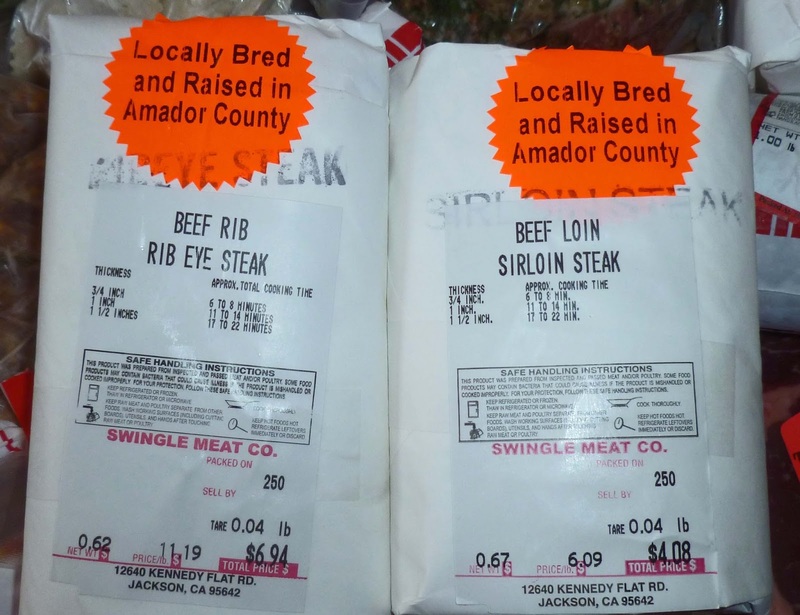 We can purchased local steaks and chops. The prices are more than reasonable. Their is only one problem and that is making a decision of what to purchase. 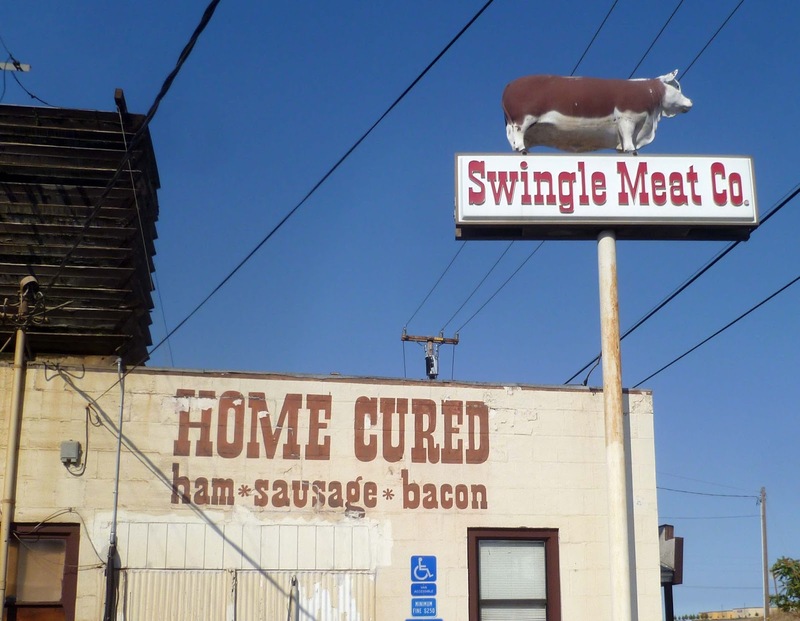 Swingles is a busy market with numerous employees bustling around doing their meat duties. Beautiful slab bacon was on our meat list. We found some beef ribs that had a healthy amount of meat on its bones. This market also sell some very good raviolis. Once again we had to use some restraint in our purchases. 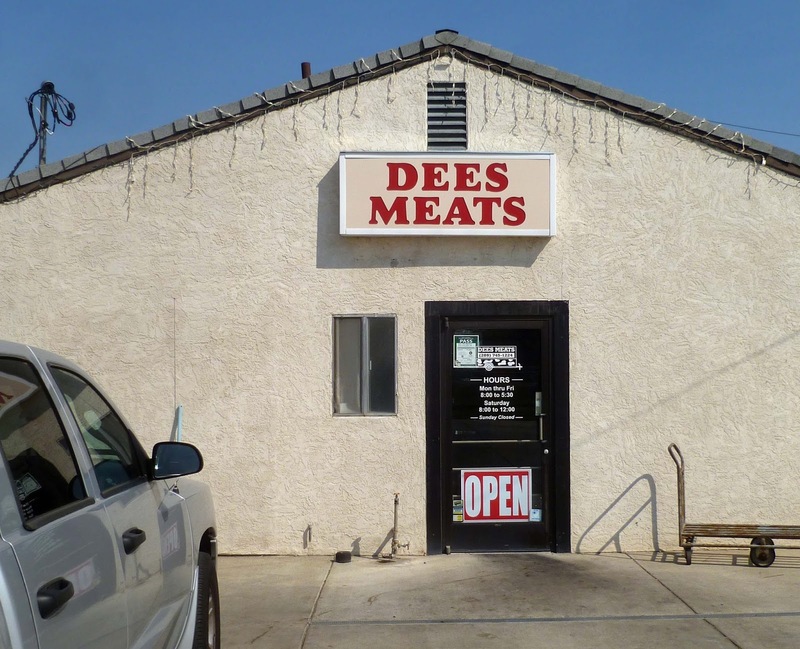 Dees Meats in Galt is a small butcher shop off the beaten path. This store is a local secret located on a rural country road. They were out of slab bacon today but that did not stop us from buying some very thick rib-eye steaks. The fat marbling through out this large hunk of meat was a thing of beauty. Dees has a good selection of sausage and we picked up some jalapeno cheese. Our next stop will be a new market that we received a hot tip about. This image is the interior of the Orangvale Meat Shoppe. This was a brand new full service meat market. The populace of Orangvale has a one stop meat shop. There is a deli counter for sandwiches. They will process your fowl and game. They also sell exotic meats such as kangaroo and boar. We did pick up some ground buffalo for hamburgers. They do have a house bacon but it is not smoked on the premise. They have sent out their pork bellies to a contractor for smoking. If I lived closer I would be a faithful customer. Our ice chest was filled to the brim. This was a successful Meat Adventure. The best part of this adventure is yet to come. We get to enjoy the bounty of our haul. A second ice chest would make a good Christmas presents for the two of you. Zoomie, We have plenty of ice chests. If I brought them I would fill them. I guess picking and choosing gives me an excuse to return. Wow. That is a true meat lovers field trip. I can't wait to see the pics of your meaty treats. Three Dogs BBQ, We had a Cordon Blu stuffed pork chop last night. The camera was out of reach to record our feeding frenzy. I may try a sirloin steak tonight. We have a competition this weekend. It is called 'Rubstock' People will be wearing 60s garb. That is a fine looking haul and should keep you supplied for a while. Big Dude, We have a lot of tasty fun sampling our bounty. We had very tender sirloin steak last night. Zoomie, You could break out your tie dye spinner dress and join the festivities. 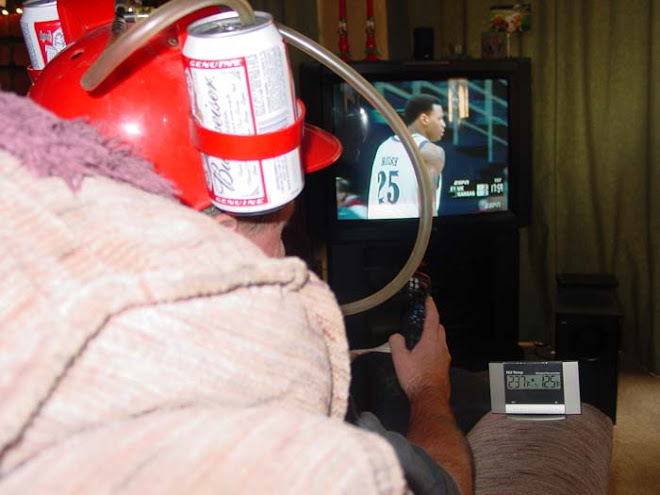 You might have too much fun. Do they have camel? My son-in-law from Senegal has me wanting to try camel hump steaks, he swears they are fantastic. Chris, There has to be a punch line somewhere.